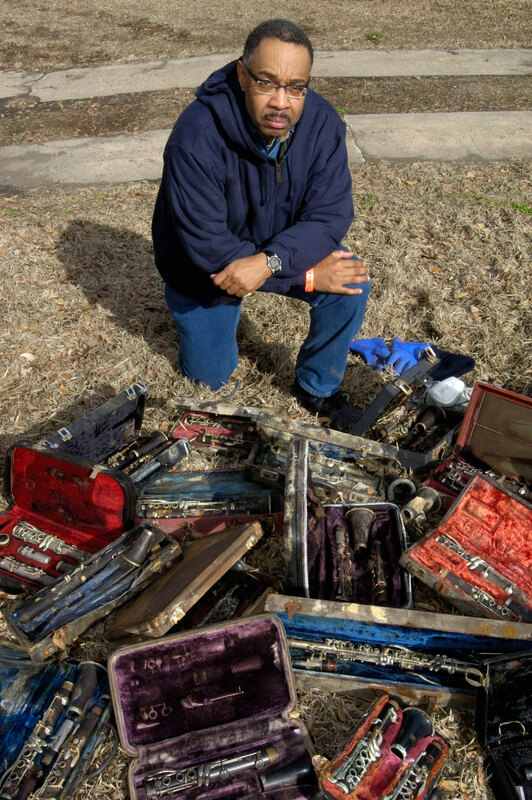 Dr. Michael White salvaging the contents of his Gentilly home, including a world-class collection of clarinets, one of which he donated to the Smithsonian. 2005. 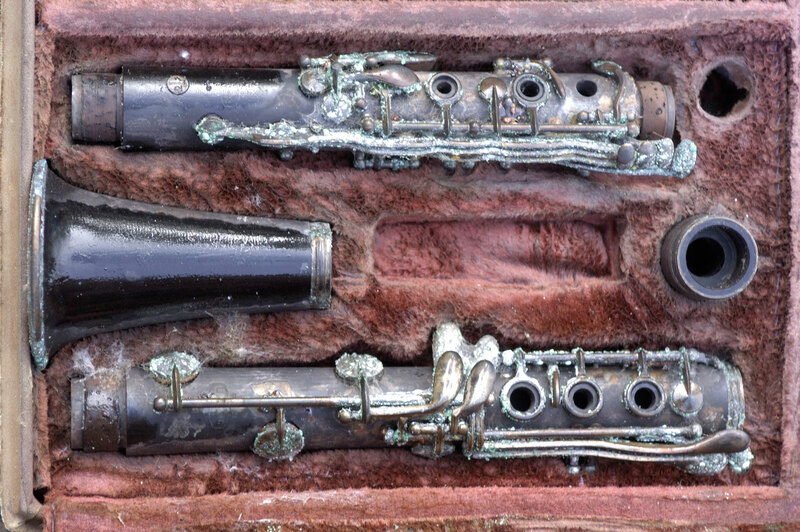 Dr. Michael White’s clarinet collection destroyed by water, mold, and rust. 2005. 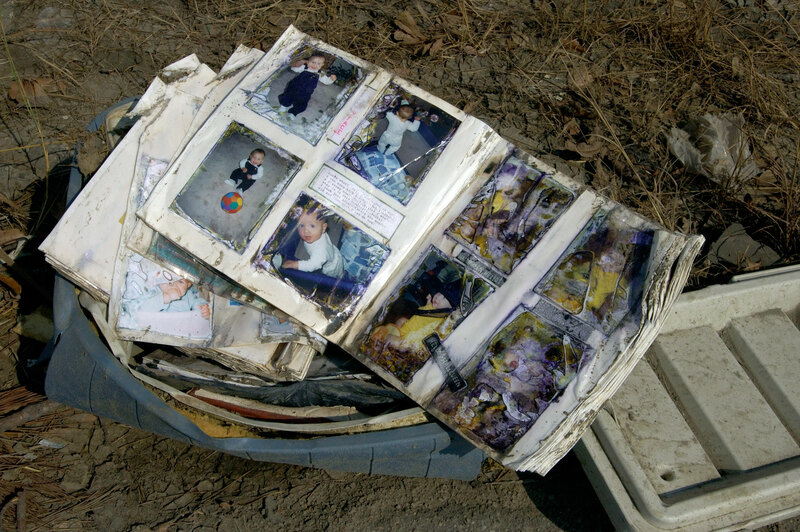 The “textures of destruction,” as photographer Hugh Talman called it. 2005. The Michael White Hugh Talman first met was wearing a gas mask and rubber gloves, standing on a pile of trash in his home. 2005. Record in Dr. Michael White’s collection. 2005. 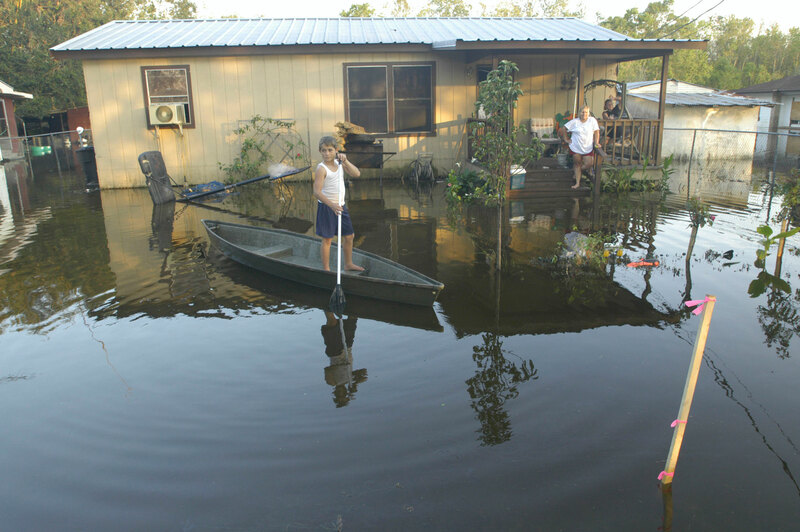 Boy in a pirogue in front of his home in Terrebonne Parish, near Chauvin, Louisiana. 2005. 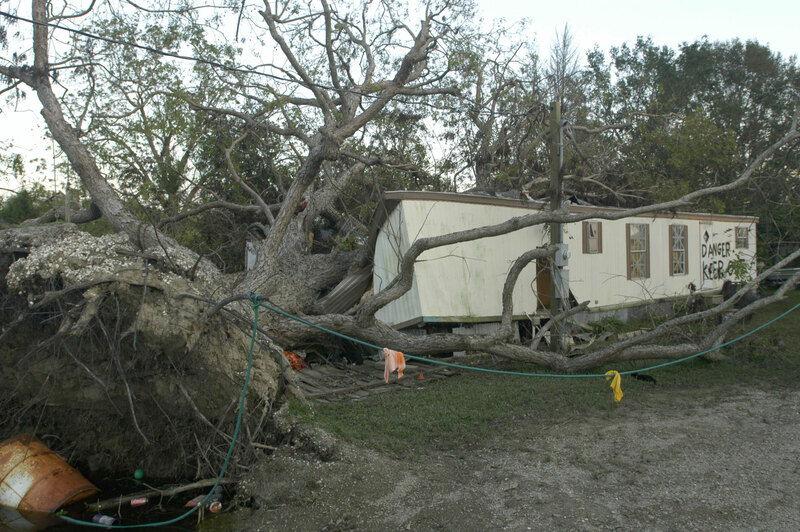 Albert Picou’s trailer home squashed by an oak tree near Highway 56 in Chauvin, Louisiana. 2005. The Williams family at Houma Civic Center. 2005. 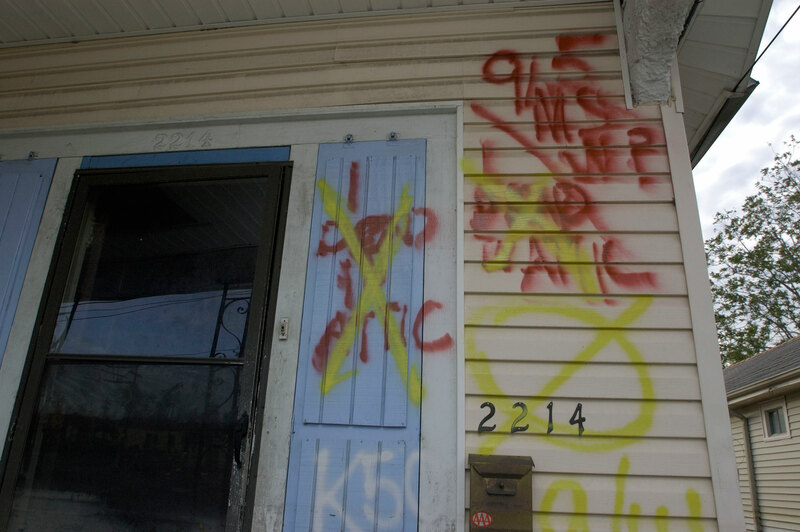 2005 Lizardi Street, New Orleans. 2005. 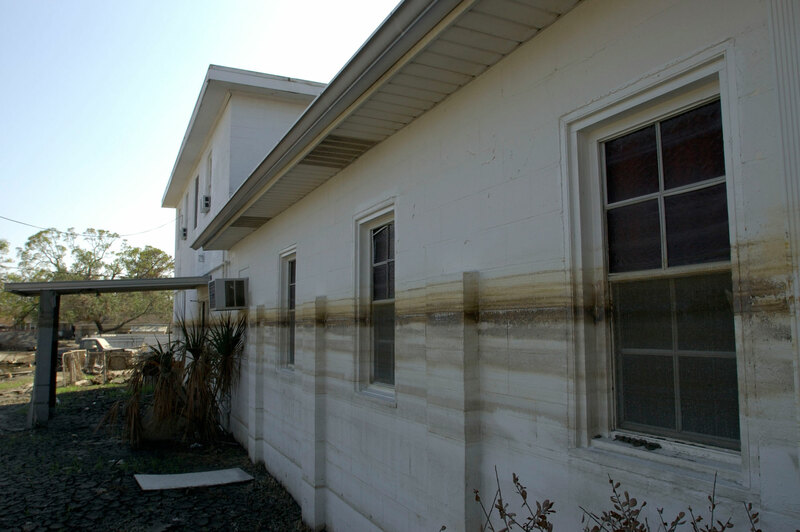 Floodwater left a mark in Lakeview, New Orleans. 2005. The Williams family home in Seventh Ward. 2005. 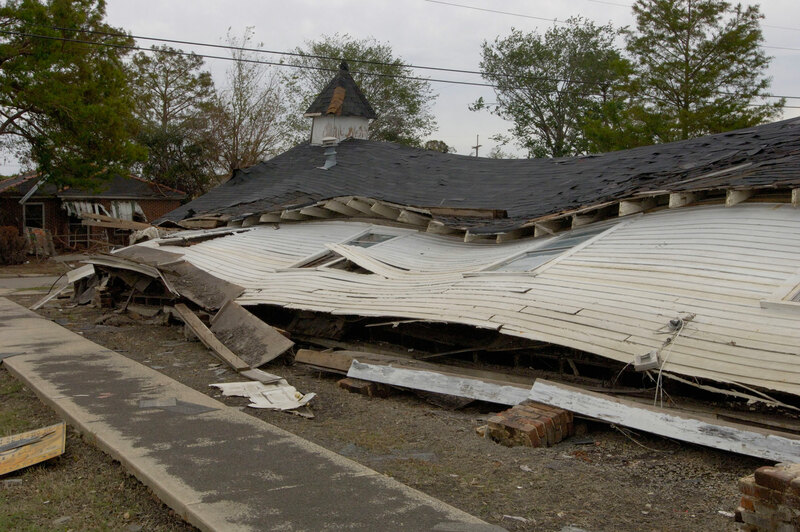 Ephesian Church in lower Ninth Ward. 2005. A memorable photo to Hugh Talman, this one shows a few rescued objects at a home in Waveland, Mississippi. 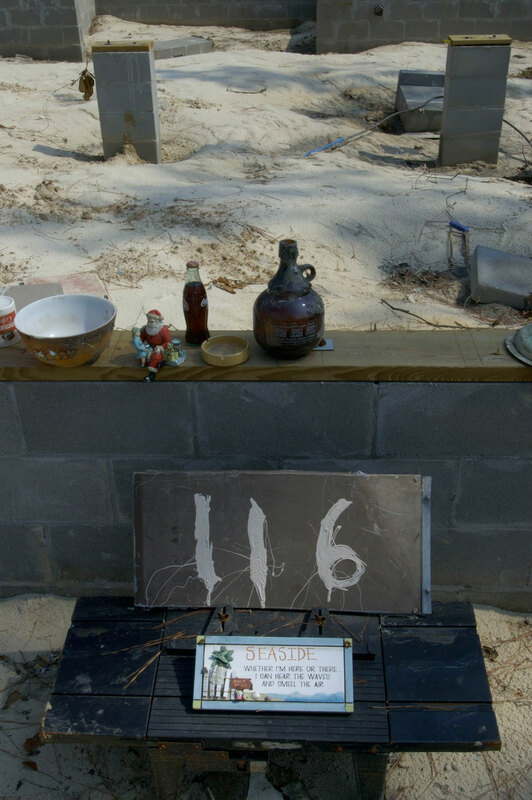 The plaque reads, “Seaside / Whether I’m here or there / I can hear the waves / And smell the air.” 2005. 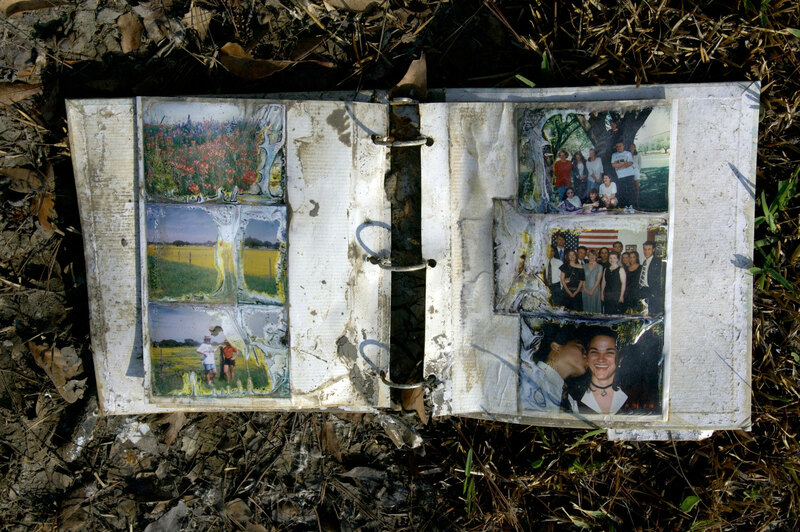 There were a lot of soggy photo albums on the roadside. 2005. 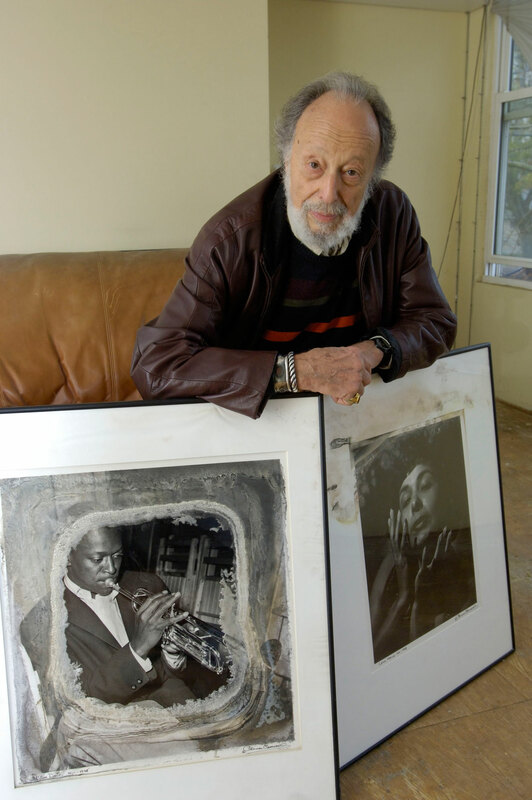 Herman Leonard (1923–2010) was renowned for his unique photos of jazz icons. 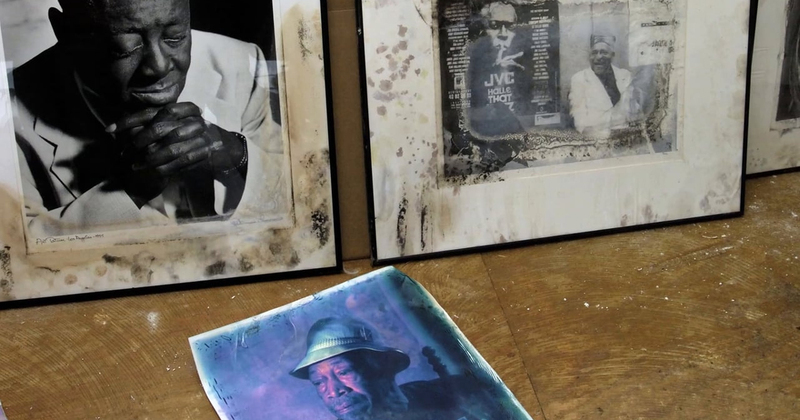 Hurricane Katrina flooded his home, destroying more than 8,000 jazz prints. 2005. 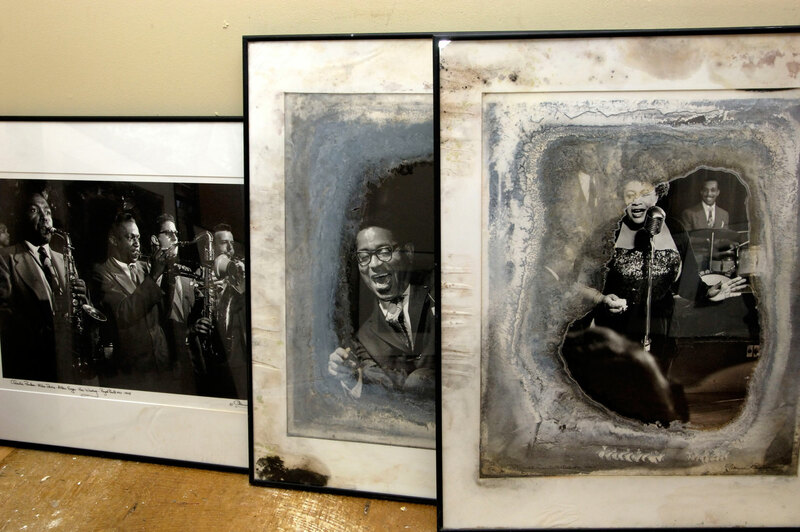 Herman Leonard’s damaged prints, “layered with the experience of going through the storm,” as Hugh Talman said. 2005. 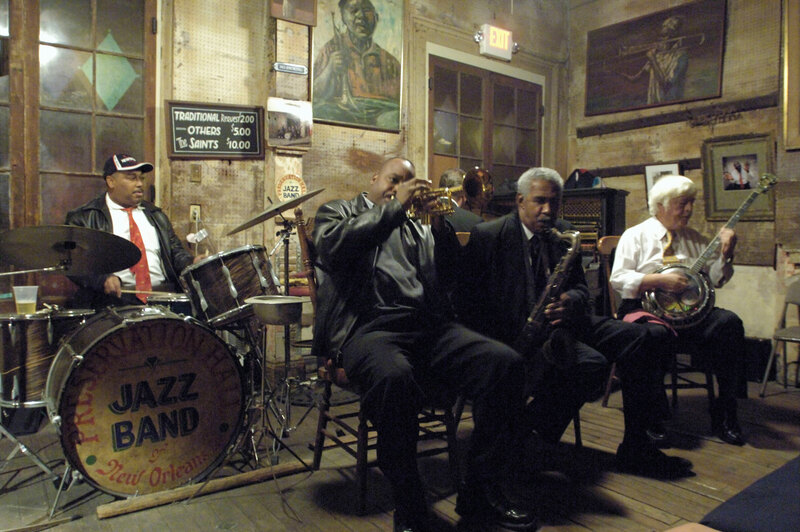 The downbeat at Preservation Hall on the night of December 6, 2005, marked the return of this New Orleans jazz venue. As Hugh Talman noted, it was like the first note “being played out in a city that was silent up until then . . . it was wonderful to see that revival beginning to take place." 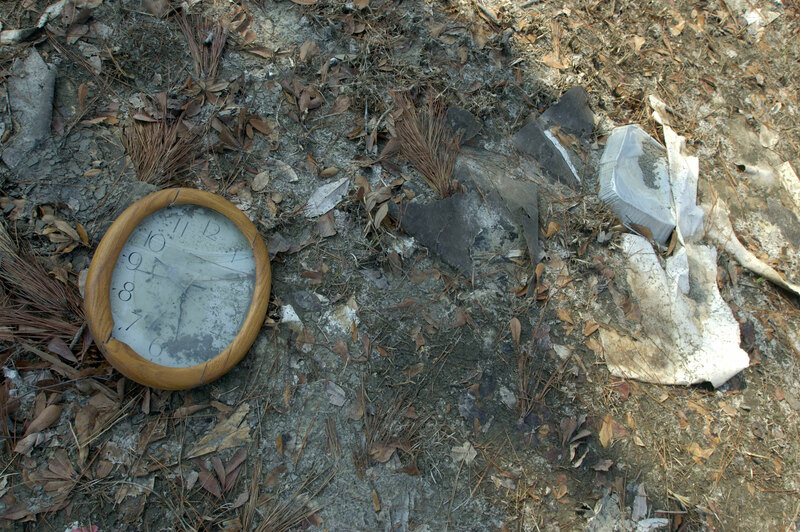 This clock found at Hunter Hollow Road in Waveland “represents the moment at which everything stopped.” 2005. 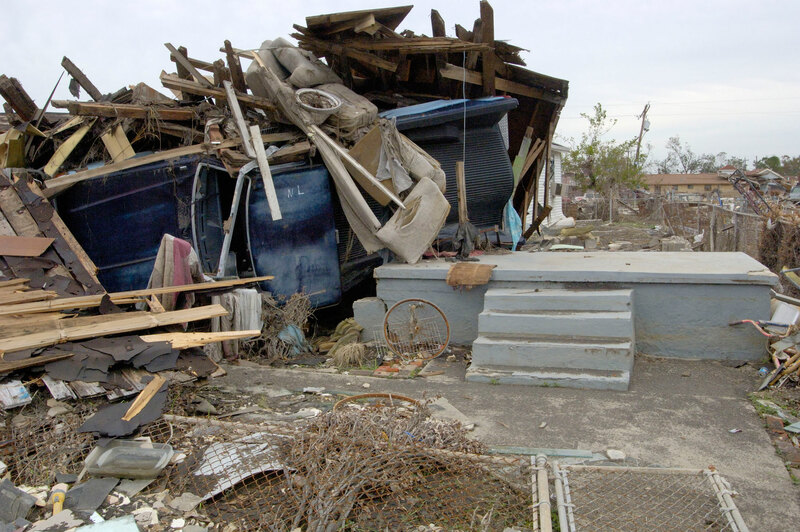 On a hot and humid morning in May 2005, I found myself alone in my car in front of a small Baptist church in Marrero, Louisiana, just across the Mississippi River from New Orleans. It had been exactly thirty years since my first professional music job there, playing clarinet in Ernest “Doc” Paulin’s Brass Band for the church’s anniversary parade. Sitting there, it all came back to me: the smiling church sisters in white, the proud men in black suits, and the anxious children carrying banners. Unexpectedly, for me, this single gig marked the beginning of a life intensely immersed in the New Orleans jazz tradition. I played for four more years with Doc Paulin in dozens of black social club parades, church processions, jazz funerals, and other events. This music was not the fast commercial version of jazz played on Bourbon Street for tourists. This was the real jazz played in the streets and neighborhoods where the music had been born. In community functions the music represented the hopes, frustrations, joys, and passions of the hundreds of people who followed alongside the processions, putting their words and gestures into movements as they danced the second line. In these celebrations, the hot improvised jazz, mixed with the dancing of social club members and parade followers, created a feeling of unity, euphoria—and true freedom. At the time, in the late 1970s and 1980s, the authentic style of traditional jazz in the United States—and even in New Orleans—was rapidly diminishing. I felt the calling and began my endeavor to preserve and spread this musical form that I believe to be one of the world’s greatest. In late August 2005, I was looking forward to a productive school year. Just before the first weekend of the semester, we heard about a hurricane in the Gulf of Mexico that was heading straight toward New Orleans. Most people thought the call for evacuation would turn out to be just another false alarm, a couple of “vacation days,” and an excuse to party with family and friends out of town. My nightmare evacuation to Houston turned out to be five times longer than the normal six-hour drive. 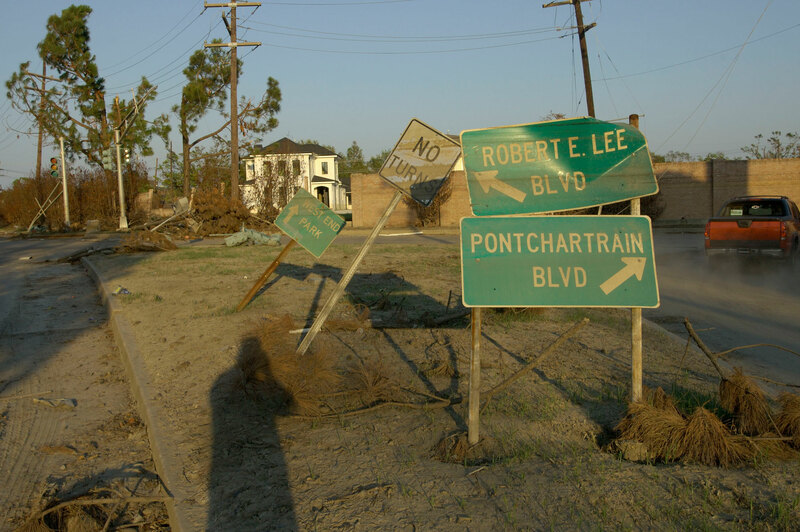 After a restless day in a hotel, we heard that Hurricane Katrina had barely missed New Orleans. As scores of familiar faces breathed a sigh of relief and prepared to return home, news broke that several high drainage levees had broken. The city was rapidly filling up with water. 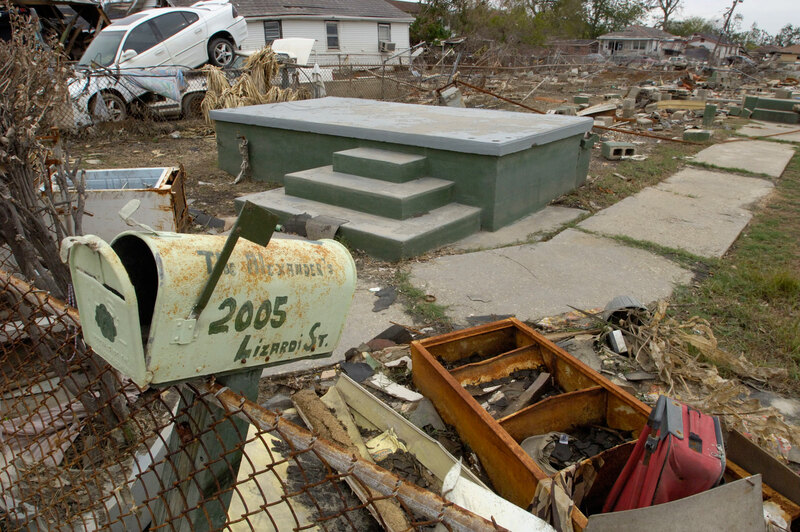 The nation watched eighty percent of New Orleans flood with as much as ten feet of water. Thousands who had stayed were sifting through murky waters or trapped in attics, on rooftops, and on bridges. Dozens of swollen bodies floated down flooded streets that only a couple days before they had walked down. There was mass panic, terror, looting, and more deaths to come. After a few weeks, the water subsided and we were allowed to return home to survey the damage. It was a horrifying scene driving in: debris everywhere, animal carcasses, a putrid odor, and a thick layer of toxic mud that covered everything. In a city where sound and rhythm formed a constant ancestral heartbeat, there was now a deafening silence. New Orleans had stopped breathing. 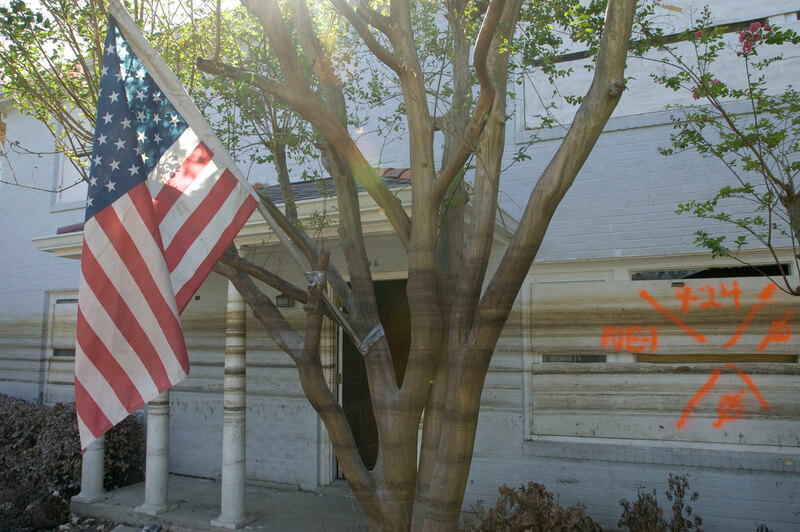 My home—housing a valuable archive of jazz, New Orleans, and African American cultural materials—had been submerged in eight feet of water for nearly three weeks. 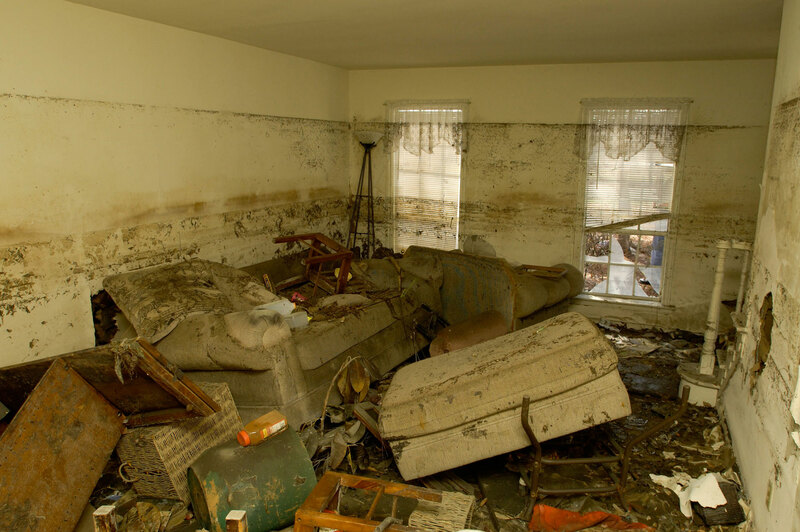 The toxic flood water and a thick layer of multicolored mold covering floor to ceiling had ruined everything. In my collection there had been thousands of recordings, books, films, music scores, photographs, and memorabilia from the old musicians. There was Sidney Bechet’s white clarinet mouthpiece and another from legendary trumpeter Jabbo Smith that were never found. 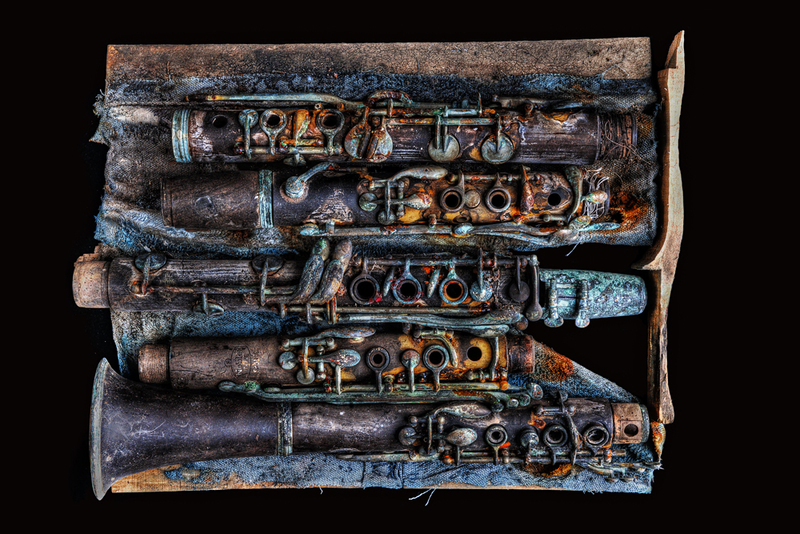 More than sixty vintage clarinets were destroyed and scattered all over that house, swollen like the dead bodies, tarnished in an array of tragically beautiful colors left by water, mold, and rust. All of my jazz history research and interviews were gone. Those first-hand accounts of legendary players, of musical battles, and of sitting alongside King Oliver’s band remained only as clouded memories in my mind. 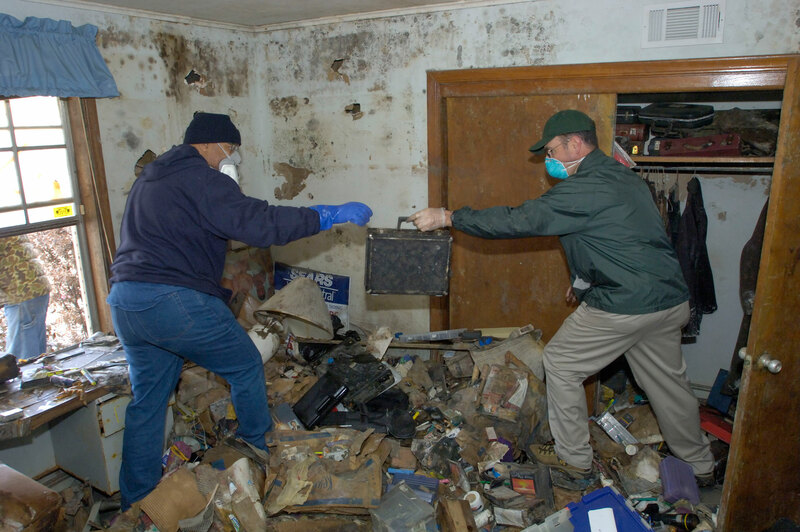 As difficult as those material losses were, the displacement and recovery process was much worse, burdened with stress, health issues, and financial strains: gutting the house, dealing with insurance and government agencies, caring for sick elderly relatives, finding housing, and so on. Only prayer and the realization that I still had the music inside of me kept me going. The jazz funeral philosophy of mourning loss and optimistically transcending to a new existence was a concept that sustained many of us on the long, arduous road to recovery. 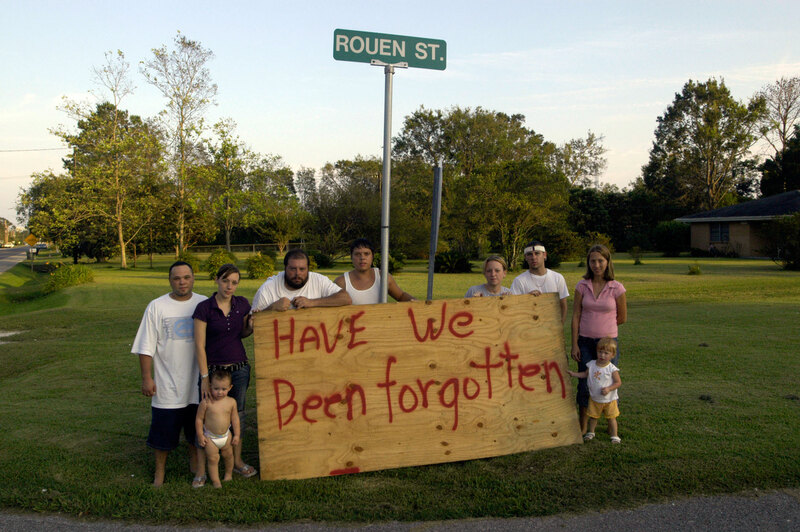 Nearly a decade after Katrina, many New Orleanians—like the city itself—remain in a state of recovery and transition. Life as we knew it ended on August 29, 2005. Much has changed. The city is different. We are different. 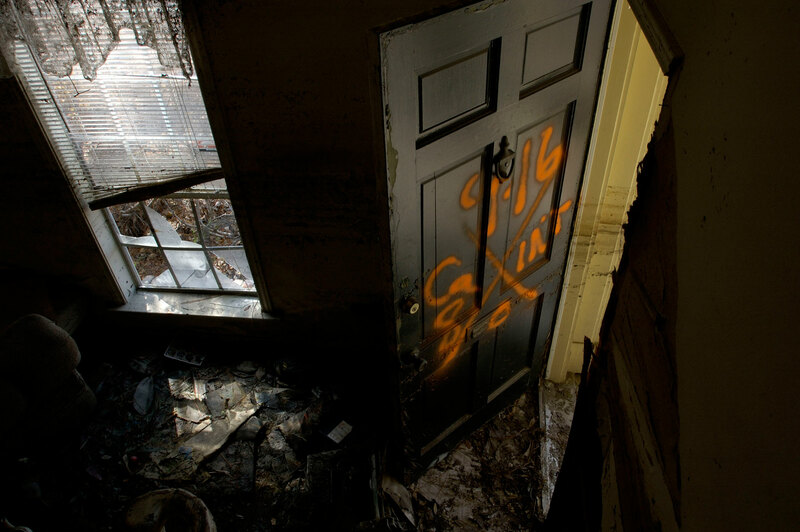 Our understanding of the geographic dangers of living in New Orleans can never be ignored again. Thousands have not returned. Of those who did many are still going through various stages of physical, financial, and emotional recovery. Some of the old neighborhoods are nearly empty or are changing. The city is quickly and quietly being gentrified. Concerns about the survival and continuation of New Orleans’ unique cultural traditions have been on the minds of many. Recovery in different degrees is taking place everywhere. The Mardi Gras Indians, Skull and Bones gangs, and Baby Dolls still parade on Carnival. Social club second line parades, brass bands, and jazz funerals are frequently seen in community streets. Yet as the city changes and struggles with a plethora of social problems, some wonder how the strong family and community bonds that produced Louis Armstrong, Mahalia Jackson, Fats Domino, and many others can or will endure. But with every ending comes a new beginning. I was able to return to Xavier and continue my career with renewed vigor. During a brief retreat at the local artist facility A Studio in the Woods, I was able to express many of my emotions about the Katrina experience and the state of New Orleans by composing several new songs, which I later recorded on my album Blue Crescent (Basin Street Records, 2008). 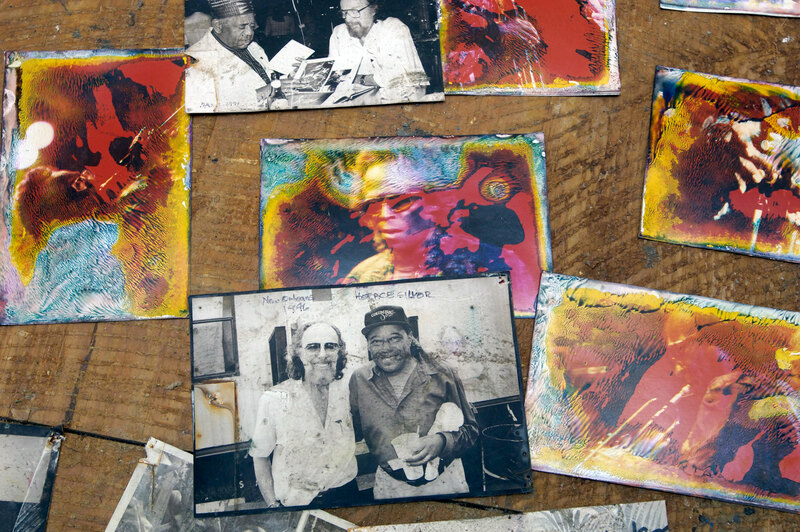 When Dan Sheehy, director of Smithsonian Folkways Recordings, approached me about producing a New Orleans album, it was apparent that he understood the importance of authentic local music. He didn’t know, though, that those obscure Folkways recordings of Billie and De De Pierce, Emile Barnes, and the Eureka Brass Band were some of the first recordings of early jazz I ever heard, fueling my initial passion. Over the years, the blues, spirituals, work songs, and Caribbean and African music I heard on the label have broadened my understanding of the roots of jazz and its place in the pantheon of traditional cultures. Capturing the valued local and signature sound of New Orleans, I compiled New Orleans Brass Bands: Through The Streets of The City to include three dominant styles: the traditional style of the Liberty Brass Band, the transitional approach of the Treme Brass Band, and the modern funk style of the Hot 8 Brass Band. The album contains everything from traditional marches, hymns, dirges, and blues to modern interpretations of rhythm and blues and funky hip-hop-influenced songs that have dominated community parades since the 1980s. 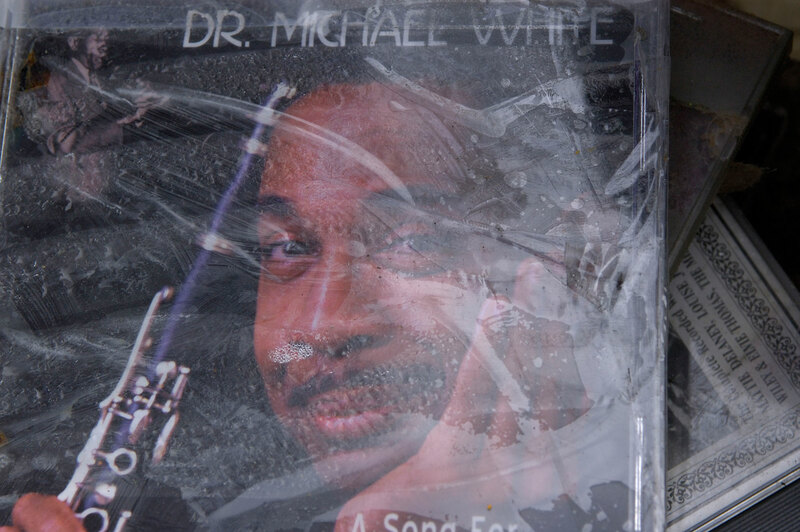 Michael G. White is a relative of first-generation New Orleans jazz musicians, a professor at Xavier University, and an acclaimed jazz clarinetist, composer, bandleader, writer, producer, and historian. 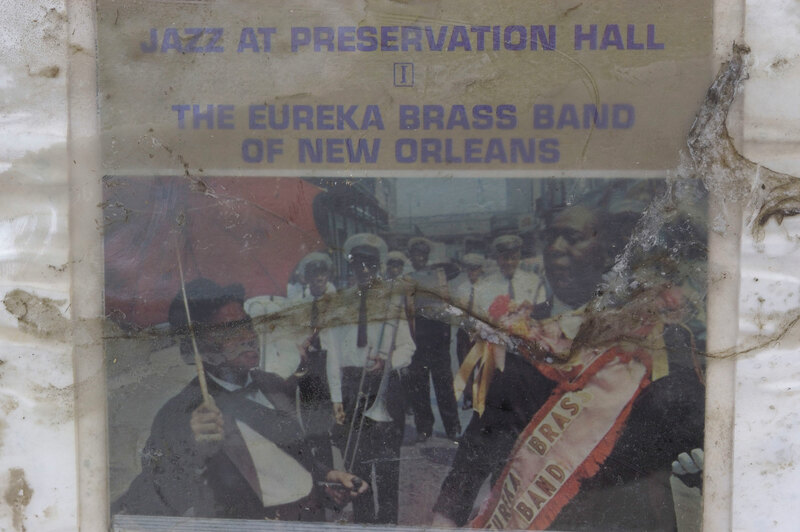 He produced New Orleans Brass Bands: Through the Streets of the City (Smithsonian Folkways, 2015). 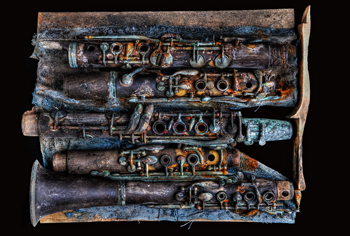 Eric Waters photographed Dr. Michael White’s damaged clarinets “tarnished in an array of tragically beautiful colors left by water, mold, and rust” in 2008. The images are published in Solemn Sounds of Silence: A Photographic Project of Reverence and Remembrance. © Eric Waters Photography. Photo used with permission from Eric Waters. 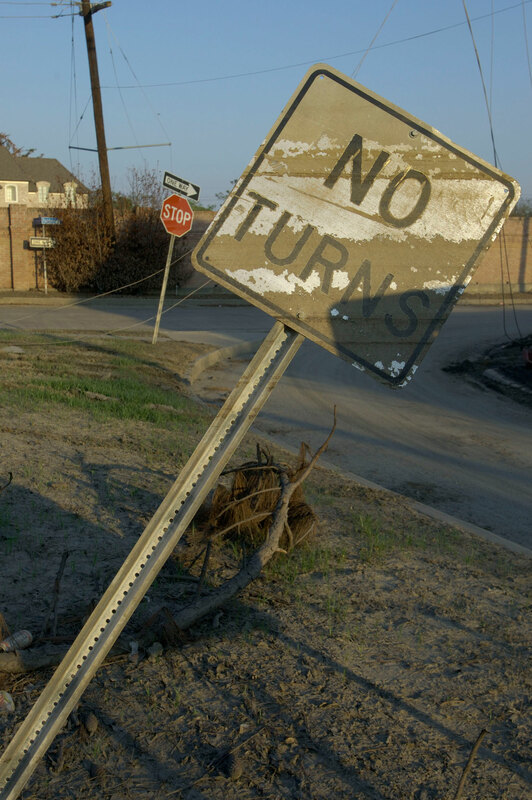 Video: Photographer Hugh Talman discusses the devastation he encountered in New Orleans after Hurricane Katrina in 2005. 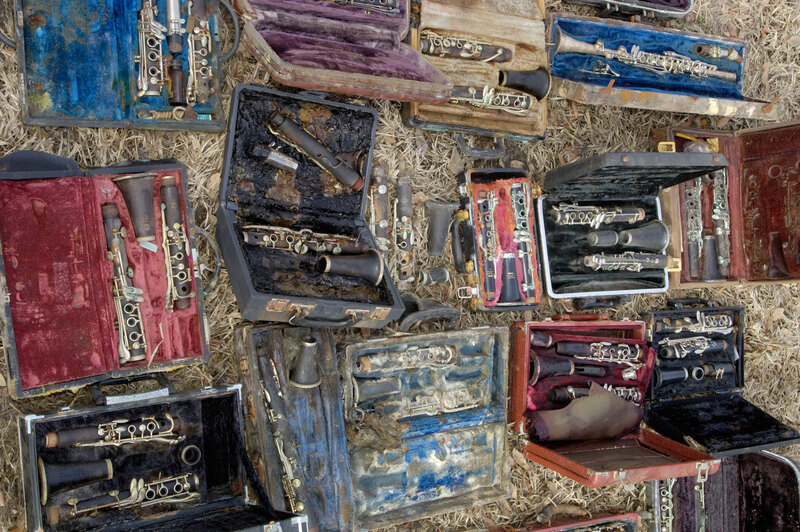 He and curator David Shayt (1952–2008) surveyed the aftermath of the storm and rescued several objects on behalf of the National Museum of American History, including a clarinet donated by Michael White. This interview was conducted in 2015. Video by Charlie Weber. Magazine: The Last Brass Band? Michael White’s article from the program book of the 2006 Smithsonian Folklife Festival, which featured an evening concert series, Been in the Storm So Long.